"No one had ever seen anything like it. The kids went berserk. They just loved it. It made fun of everything they loved to see made fun of..."
One thing I learned watching Comic Book Confidential, a documentary about the history of comic books in America, is the fact that the people who draw comics are, by and large, some strange cats. Also, that very same history of comic books is a long, strange trip that is closely entwined with the cultural history of this country. From the early days of Superman and Batman to the explosion of comic book commerciality today, the nature of the medium has reflected both the changes in and the dark side of America's psyche. At the same time that the surface of America in the Fifties was painted with the grayscale tones of Leave It to Beaver, Father Knows Best and popularity of Doris Day, the same people who were breaking rock-n-roll records and hunting Communists were burning comic books. There can't be much higher validation than that. Anyone who has interest in the history of this "literary" genre will find Ron Mann's film from 1989 fascinating. The current trend of comic book characters making the transition to mainstream movies such as Superman, Batman, Spider-Man and the upcoming Daredevil add a new level of relevance to this film. Although Comic Book Confidential covers a lot of ground, there is a nice, fast-moving mix of commentary from the comic book creators and montages of imagery from their creations. Like so many of the institutions today that have found a boon in merchandising, the roots of comic books demonstrate a time when people were compelled to communicate ideas by an inner voice. This need for expression often bounced up against the walls of suppression and convention. The tale is told intriguingly and stylishly by director Ron Mann. Several strips are shown panel by panel with reading of the dialogue by the author. The conventions of comic books are used to frame and drive the film. What emerges is a fascinating story that is told very engagingly with great humor and self-deprecating irony. Making appearances are such disparate comic book luminaries as Stan Lee, R. Crumb, William Gaines and Harvey Pekar, often filmed in their natural habitat. The various sub-genres of comic books are explored from the gross out horror styles of the Fifties to surrealistic graphic novels of today. Familiar icons of comic stardom like Mr. Natural, Zippy the Pinhead, Spider-Man, Captain America, Mad Magazine and more are analyzed and placed in postion in the pantheon. This documentary nicely achieves the twin goals of being interesting and entertaining. There is no doubt that watching this film will inform the comic book fan of some of the foundations of the publications he or she enjoys and, for the person who has never picked up a comic book, there is material here that might entice him or her to take a look at this popular art form. Image Transfer Review: The documentary is shown in full frame 1.33:1 format and achieves a very strong visual impact. The director uses a multitude of stylistic touches to move the story along and the image is consistently crisp and colorfully expressive. Audio Transfer Review: Helping the documentary along is a very nice musical soundtrack and well designed sound effects that add a touch of humor and irony. The sound is a decent stereo mix, which provides a decent fullness and avoids typical documentary tinniness and/or drone. Extras Review: Kevin Smith provides an informative and ironic introduction to the film that also serves to reinforce some of the interesting parallels and cross-influences between film and comic books. The Comic Book Archive is an excellent addition to the film. Often in viewing a documentary about a particular form of art, one is interested in immediately looking deeper at examples of a particular entity. Here you can click through examples of complete stories by the artists featured in the documentary and see their work in its proper perspective within the pages of a comic book. The last extra on this disc is a short interview with director Ron Mann. Although the interview itself is not particularly illuminating, it's addition to the DVD is a nice touch. 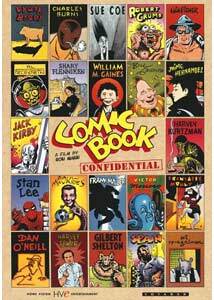 Comic Book Confidential is a fascinating look at the history of comic books in America. If you ever have laughed at Zippy the Pinhead or the Fabulous Furry Freak Brothers, thrilled to the heroics of Captain America or the Silver Surfer, or cracked up at the satire of Alfred E. Neuman... you will enjoy this film. And, if you have never done these things, this film might make you wonder what you have been missing.